The news mid afternoon that President Trump’s trade restrictions could be increased and a retaliatory Chinese tariff increase all coupled with latest China/US trade numbers turned most core indices. Following yesterdays strong Shanghai performance we saw some retracement of Tuesdays gains with the index closing down 1.25%. Although the Hang Seng index was also hit upon the figures release, it did manage to re-climb into the close ending the day higher at +0.4%. Energy, banking and real estate led the bounce, but that’s probably the benefit of having a separate currency. The Nikkei ended the day almost unchanged, as it too was hit mid-afternoon which also saw a resurgence in the Yen. Encouraging signs in Australia as commodities found support and so A$ and ASX found renewed buyers. The SENSEX and INR had an extremely dull day even as the index managed a +0.6% return whilst currency played in a quiet tight range. Europe just seems to be meandering in the middle as trade talks are hurdled from side to side. One of the key headlines making news in Europe is the UK’s possible “No Deal” BREXIT. Sterling is starting to price this event, as today we saw another -0.6% decline taking it to the lowest level in almost a year (1.2855). The decline in cable was good news for the stock market and we saw a +0.7% rally in todays FTSE. 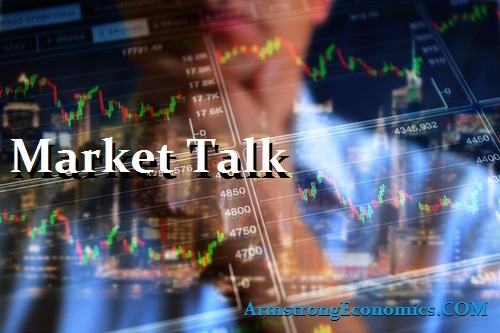 Most core and non-core markets closed almost unchanged, but we did start to see a further re-pricing in the bond market, especially as many players are away on vacation. US were expecting a slightly weaker opening following the lead made by futures, but this was to be only temporary. One of the most impressive performances today was led by the Russell 2k, which reversed early steep losses to end the day just off of its all-time highs. That is what is impressive of both the DOW and the S+P as both are within inches of their own historic records. Still we are seeing record revenue and expectations that are beaten almost daily. Cash looks to have finally decided it can no longer sit on the side-lines and is starting to find its way back in. The USD remains the key as DXY improves yet again. Energy is losing much of the fear factor bid, as crude lost over 3% as demand and supply appear at odds. Japan 0.11%, US 2’s closed 2.67% (u/c), 10’s 2.97% (u/c), 30’s 3.12% (u/c), Bunds 0.4% (u/c), France 0.72% (u/c), Italy 2.90% (+3bp), Greece 3.96% (+2bp), Turkey 18.22% (-77bp) – as talks start between the US and Turkish government, Portugal 1.75% (+1bp), Spain 1.40% (+1bp) and UK Gilts 1.31% (-1bp).